There is nothing tender about this curry. This is unapologetic with bold flavors of mustard and mustard oil; a mean curry you might call it, for the more chili pepper you add the better. It is not toned down with yogurt or coconut, might make your eyes and nose water and for sure open up your sinuses, but it is this untamed taste and flavor that is pleasure for me. With the cooler temperature, the light gets softer and it is such a calm, relaxed feeling as I sit and watch the light shimmer through the trees playing with the wind and the shadows, starting to cast longer shadows even at 3 in the afternoon. It transports me home – the blue skies and the huge fluffy clouds, the light nip and the biggest religious festival in West Bengal – Durga Puja. Woven with the festival are the socio-cultural activities that simmers and bubbles in the heart of every Bengali. A religious festival it is, but in real life the religion takes a back seat. Food plays a major role and this space and time is too little to even start to describe the enormity of feast we have. The early mornings during this 10 -15 days begin with the rhythmic beat of the decorated drums, as we listened to it, enchanted and sleepy still in our beds. Outside beneath the Shiuli tree, the white and the orange flowers lay like a pretty blanket rippling the sweet fragrance everywhere. The day would start with festivities, food and activities as we hurried, gathered our friends and walked to the pandals to spend hours of being together amongst idols, magical smoke of the prayers and chant and of course food. The schedule during these days is quite unlike the rest of the year. Plethora of food, new clothes, music, lights, prayers, that wonderful connection with family friends and the community – the entire spirit of this time is surreal, and it passes as fast as it came. It has been 17 years that I have not been “there”, about half of my life. I don’t even know if I miss it anymore in that severe heartache kind of way. The memories are sweet and calm. Everything seems very very far away, a trance… slowly fading in to past as if it never happened. It is not that the Durga Puja is not celebrated here. The Indian Community mingles and in some places it is really a big community thing during this time of the year. But I never feel the urge to go, maybe because I know for sure that it is never going to be the same as back home. I won’t be a child running down the streets with my friends, or picking up the shiuli flowers from the backyard or stretching in the bed not sure if I am awake or dreaming of the drums. I won’t bury my nose into the new clothes planning on what to wear on each new day. It is different. The weather is pleasant enough to take a walk without panting and having to drink gallons of water. I hear the drum beat in the distance when I call home, but my heart does not beat with it anymore. A part of me is lost. I have not been able to keep that spirit alive; it is a pity that it happened, but it true, an honest confession from my part. For my girls, the festival is as good as a fairy tale that I read to them. They do not look forward to that fortnight of delirious fun like I did, instead they are looking forward to play more often and ride their bikes. The toned down Texas autumn is here and is life is different but good. We grew up eating a lot of fish, and a lot of mustard. This is one of those dishes which combines the two popular things together. Now dishes like this one always makes me nostalgic about home. For an authentic taste, fresh water fish steaks with bones are used. If this kind of fish is not available, use the fish fillet like Tilapia fillet. Mustard oil plays a very important role here. The aroma of the dish is primarily because of the mustard paste and mustard oil. You are free to substitute but you will miss out on an important aspect of this recipe. Traditionally the fish steaks are deep fried. If you do not want to deep fry, shallow fry the steaks on both sides in a thick bottomed pan till they are golden and crispy. Soak the ingredients for the paste in 1/4 cup of water for about 30 -45 minutes. Grind the mustard, green chili peppers with salt to make a thick paste (This paste is called “shorshe bata”; Shorshe=mustard Bata=ground into a paste). [Alternate way to make mustard paste : Make a paste with the green chili peppers – either use a blender or a mortar and pestle. Dry grind the seeds and then mix the powdered seed with about 1/2 teaspoon vinegar, 1/2 teaspoon turmeric, salt, and green chillies and 1/4 cup water and let it sit for about 30-45 minutes. Prepare the paste in a way which is convenient for you and set aside. Marinate the fish steaks in 1 teaspoon turmeric and salt for about 10-15 minutes. Heat enough (the fish will be deep fried) oil in a deep-bottomed pan/wok/kadai on high heat the oil starts to smoke. Reduce the heat and carefully place a few pieces of fish in the hot oil; do not over crowd. If they do not fit, fry them in batches. Increase the heat to medium and fry the fish pieces till each side is golden brown. Turn them over mid way. (They will easily turn when cooked on that side.). Remove with slotted spoon when done and set aside. Combine the rest of the turmeric, salt and the red chili powder with 1/2 cup of water; set aside. If you have used mustard oil to deep fry the fishes, you can use the same oil to cook the dish. Drain the oil in the pan/wok and put the oil in another pan. If you have not used mustard oil to deep fry the fishes and you are using mustard oil to cook the curry, put the 2.5 -3 tablespoons of oil in the pan. As the oil starts to smoke, add the slit chili peppers. Keep the heat at medium. As soon as the chili peppers sizzle, add the red chili-turmeric paste and simmer, stirring constantly for about 2-3 minutes. Now add the fried fish pieces, slowly, one steak at a time and let each side of the fish cook for about a couple of minutes before adding the next piece. Each piece of fish should be coated with the chili turmeric mix. Once all pieces are coated as above, add the mustard paste, add another 1-1.5 cups of water, turn the heat to high and bring to a boil. After it starts to boil, lower the heat to medium and simmer till the sauce thickens. There should be enough sauce to coat the fishes and a few tablespoons left. It will not be thin and soupy. Not exactly sure if this post is a snug fit for Pree’s Beyond 5 days of Durga Puja, but I am sending it in anyway. September 28th, 2010 | Category: Curries, Main, Entrees etc, Seafood, Sides & etc. This looks wonderful..I always cook fish in goan/malvani style. I guess this should be my first recipe to start some bengali cooking. I hope get to visit back home for durga pooja ! Lovely fish curry. Never did this way. Thanks for sharing !! Soma, this shorshe maach is not for the faint-hearted. But it brings back memories of the homemade Durga Pujo delicacies. Hope you and your little girls have fun this Durga Pujo. I second you on the fading festive memories.The festivals are not the same here. 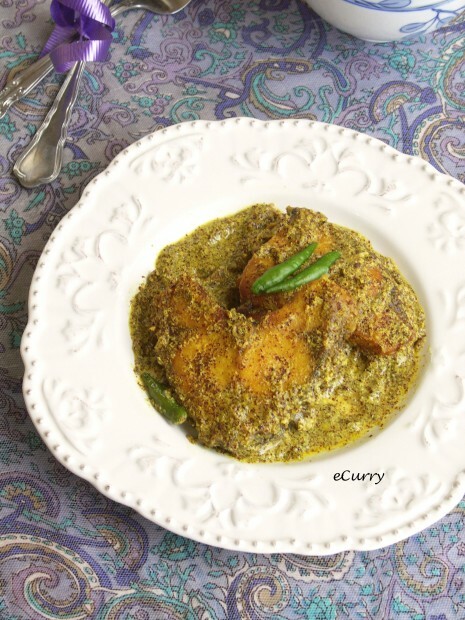 I had this curry during one of the bengali weddings in the family.It was deliciously flavorful and pungent.your version looks ditto! Shorshe Maach is my eternal fav..it so so reminds me of home…and u have so well captured the heart of a bong before the pujas. Shorshe maach looks phataphati ( awesome) . Colour looks so inviting. Perfectly made. Love the fish curry recipe!! Looks so flavorful & delicious! Just discovered you and your blog via Twitter! Love it!!! I’m missing Indian food dreadfully so your posts are making me salivate. I wished you’d enter our food blogging contest – you simply have to post about a quintessential dish of a place. See here for details: http://bit.ly/cKqzv0 Deadline in a few days! This looks so delicious. The pictures are gorgeous. How can any bong’s memories be complete without Shorshe Maach 🙂 My hubster tells me bongs eat way too much fish and I love fish so I consider it being so lucky! Yours look amazing. I can relate with you and i guess lotof us who live outside Indian feels the same. Love the look of this fish curry, we were invited to a bengali home when we were in London and they had this delicous fish curry there too. And now i am drooling for this. If flavorful dishes like this come with autumn, I welcome it with open arms. Thanks for sharing this recipe Soma! That looks delicious..I also do dry grind mustard seeds in bulk and use according in my recipes..Tumi ekbar seshe mustard seed paste diye dekhbe , shorsher jhal khokhono bitter hobe na..
tumar melon fruit bowl er post ta darun hoyeche …lucky you for having such a beautiful kitchen garden.. The curry makes me drool never tasted the Bengali way! For our kids, when fall comes they just wait for Halloween and costumes ! This sounds wonderful with the mustard! This sounds delicious. Where do you buy mustard oil from? I have never seen it. Weekend Cook and Tell Round Up: Feel-Bad Food | Lady Centre - The Hottest Fashions and Styles Right Here! I have been looking for this recipe for such a looong time!!! YAY! finally found it.. going to make it soonly..
P.S: this is usually made with hilsa right? what is a good substitute? Mackerel/snapper? yes this is made with Hilsa too. Usually nigella/kalonji is used to temper along with the green chili pepper. But the more popular way to make the hilsa is steaming it. 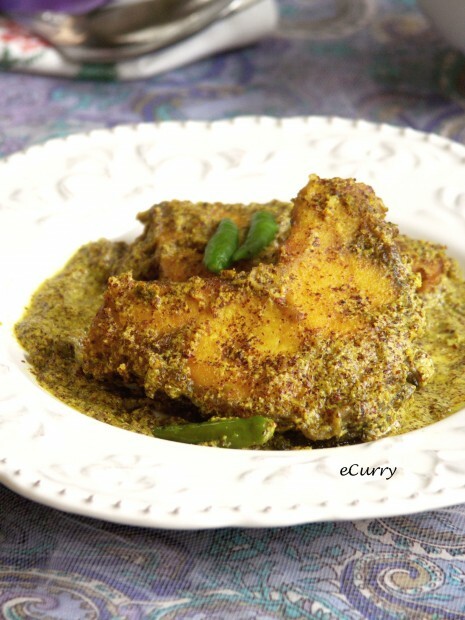 (I have the recipe here: http://www.ecurry.com/blog/curries/gravies/bhapa-ilishsteamed-fish-in-mustard-yogurt-sauce/). The steamed hilsa is way quicker and easier to make. I have never made with Mackerel/Snapper. if you try it, do let me know! this sauce looks delicious. i’m vegetarian and i’d like to use paneer instead of fish. do you know about how much paneer i would need? You could use about 12 oz paneer, cubed for this sauce. If the sauce looks too much, you can simmer it down. I would suggest this sauce with Potatoes too. It tastes really good. If you make it with paneer, let me know how it turned out if possible. I am curious to know for I have never made it with paneer. Thanks for the recipe, it turned out great. Spicy, but we can handle that 🙂 It did seem like the haldi was too much though. It might be because I used pollock fillets. Either ways, I might go low on the haldi next time. All in all this is a great recipe, my first one without using coconut milk! Thank you and thank you again for telling about the haldi. Yes that is a lot. it should have been a teaspoon, and I made a mistake. Truly sorry. I hope it was edible. Am going to update the post right now. Is this dish supposed to be made with yellow or brown mustard seeds? 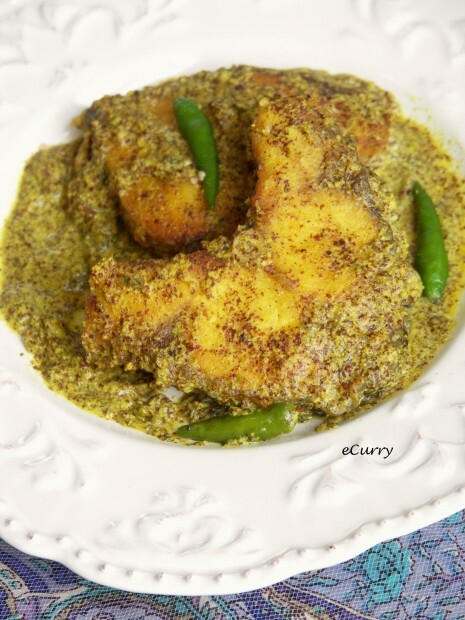 I recently tried it using yellow mustard seeds, and while it was delicious, I don’t have a basis for comparison as this is my first time making a Bengali recipe. Any one of those will work. The yellow one is mild in flavors. You could do a mix too. Its very good post.This is testy sauce.I am vegetarian.and l like this blog very much. Thanks…. Click here. This turned out bitter. I have meticulously followed the recipe. Very disappointed. I am sorry it turned out bitter. However I do not think it has got anything to do with the recipe. It is usually the mustard (the skin) that tends to makes it bitter. The recipe or I cannot say which kind of mustard will behave how. The traditional recipe does not require vinegar as the paste is made in stone board. No metal blades of blenders. I have notices that mustard blended in blenders do tend to get bitter. Not exactly sure of the science behind. Vinegar is used to help with that, or nullify the bitterness as the grinding stone is not always available. Another option would be to remove the husk of the dry ground mustard, or strain out the mix after grinding it. The yellow mustard tend to be less bitter, but it is not as strong as the brown ones. You may try using a mix of the two.